A spokesman for Mangano told NBC 4 New York Wednesday that allegations of wrongdoing were "complete rumor mill and nonsense"
Nassau County Executive Ed Mangano, his wife and Oyster Bay Town Supervisor John Venditto have been indicted on corruption-related counts for allegedly accepting bribes and kickbacks from local businessmen -- including a no-show job for Mangano's wife where she made more than $450,000 as a "food taster," federal authorities said. U.S. Attorney Robert Capers said that the trio was named in a 13-count indictment unsealed Thursday. Mangano and Venditto both face multiple corruption-related charges including fraud and conspiracy to commit federal services bribery. Mangano was additionally charged with extortion, while his wife, Linda Mangano, was accused of making false statements. All three have pleaded not guilty to the charges and were released on bond. "I'm going to continue to govern and go to work. You'll all have an opportunity to hear everything and decide for yourselves," Mangano told reporters afterward. 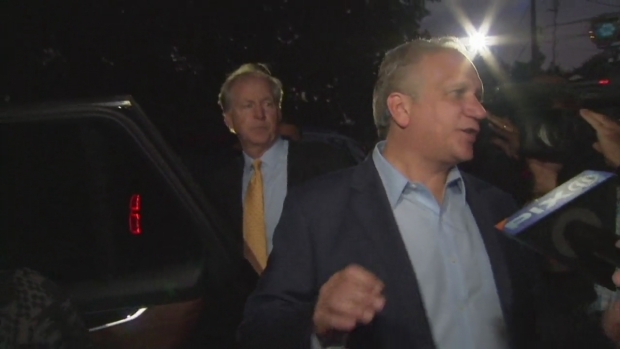 Nassau County Executive Ed Mangano was seen leaving his house for the FBI's Melville office early Thursday morning. Prosecutors are expected to unseal a federal corruption-related indictment against Mangano, his wife, and Oyster Bay Town Supervisor John Venditto Thursday. Capers said earlier, "No one is above the law, and the defendants will all be held to account for their actions." Federal prosecutors alleged that Mangano, Venditto and others received bribes and kickbacks from an area restaurateur and businessman from 2010 to 2015. The indictment alleges that the two elected officials took kickbacks and bribes in exchange for Oyster Bay to guarantee about $20 million in bank loans for the restaurateur. When the business owner defaulted on one of the loans in 2015, the lender demanded that Oyster Bay remit payment on the outstanding balance. A job for Mangano's wife was among the kickbacks that the Nassau County executive is accused of accepting. Federal prosecutors allege that the restaurateur hired Linda Mangano to a job in 2010 and paid her more than $450,000 over several years. But they said she didn't actually do anything in her role -- and later listed "food taster" as one of her duties. Mangano was additionally accused of accepting five vacations between 2010 and 2014, a $3,371 ergonomic office chair, a massage chair from Brookstone, wood floors in his home and a Panerai Luminor watch valued at more than $7,000 in 2012. Venditto, meanwhile, is accused of accepting limousine service for more than two years. He also accepted discounted rates for fundraisers at the business owner's restaurant. 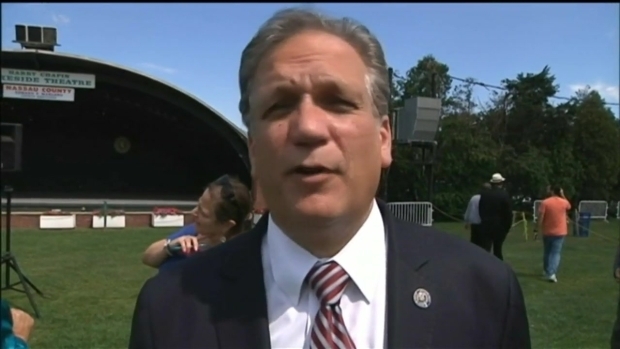 Nassau County Executive Ed Mangano and his wife are expected to surrender to federal agents on Thursday in connection with a federal corruption probe. The news comes as Oyster Bay Town Supervisor John Venditto was arrested. Katherine Creag reports. All three are accused of lying to agents from the FBI and IRS during the investigation, and Mangano and his wife allegedly met with the restaurateur to create stories to explain Linda Mangano's job and the vacations the family received. Capers wouldn't reveal the identity of the restaurateur, but questions have swirled over Mangano's ties to restaurant owner and businessman Harendra Singh. Singh has restaurants in Bethpage and Oyster Bay, including one at the town's golf course. Singh was arrested last year and has denied charges he bribed one Oyster Bay official in exchange for getting loan guarantees. He was also accused of lying to FEMA in order improperly collect $1 million Sandy relief money. Singh's attorney declined comment on the case this week. The Manganos' attorney did not immediately respond to a request for comment. Venditto's attorney declined to comment. On Wednesday, shortly after NBC 4 New York first reported Mangano would face federal charges, spokesman Brian Nevin denied the county executive committed any wrongdoing. "County Executive Mangano has the highest integrity, has done nothing wrong, has not been contacted, and the accusations are preposterous," Nevin said. Nassau County Executive Edward Mangano could be taken into custody on Thursday to face federal corruption charges. Katherine Creag reports. 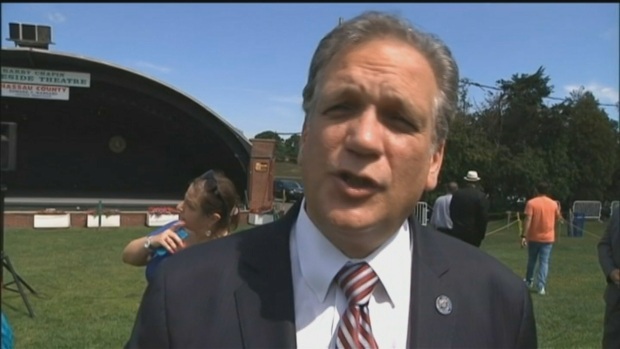 Mangano was first elected county executive in 2009, and re-elected in 2013. Prior to becoming county executive he served seven terms as a county legislator. He worked as a janitor to put himself through college, eventually earning a law degree from Hofstra.